Back traction, also known as non-surgical spinal decompression, is one of the most commonly used therapies by Chiropractors and Physical Therapists to treat chronic back pain. The medical science community has not widely supported spinal decompression yet (due to lack of scientific studies) but it has been successfully used by thousands to relieve back and neck pain for years. For those of us with back pain and that can’t afford to go to a chiropractor several times per week, there are several ways to perform spinal decompression from home using a variety of devices.These devices are generally safe, but you should still consult your doctor beforehand since things can go wrong and cause more damage to your back if you don’t know what you’re doing. How Does Back Traction Heal Back Pain? Inversion tables are a type of table that can rotate 180 degrees to turn the user upside down while they hang from their ankles. This uses gravity expand the spine and take pressure off your spinal discs. This device works well for a variety of back problems but is especially effective for people with slipped or herniated discs. While most of the evidence about the effectiveness of inversion tables seems to be anecdotal, many people swear by them and claim they are a real alternative to back surgery when used on a regular basis. Lumbar devices can vary from a simple, arched plastic board that you can lie on to actual spine stretching machines that can leverage a door and a lever to extend the back. Typical back stretchers help the spine by repositioning it into its natural position, helping you unload the discs that might be slipped, twisted, or our of place. These devices are very simple, compact, and cost-effective. There are several commercial stretching machines that can help you stretch out and decompress your back, legs, and more. These are typically more expensive than the other options but many users find it to be worth the cost. A few examples are the pretor 240i Commercial Series StretchTrainer and the LifeSpan SP100 Stretch Partner Stretching Machine. Pull up bars aren’t actually intended for spinal decompression but they certainly can get the job done. The primary drawback is that it is difficult to fully relax the back while maintaining your grip on the bar for several minutes at a time. One solution to this is to buy some wrist straps to help hold your grip on the bar, or to purchase some gravity boots and use them to hang upside down from your ankles. If you choose to go this route be absolutely sure your pull up bar is properly installed and able to handle your weight or you’ll risk seriously injuring yourself. Many physiotherapists recommend Inversion Therapy to patients suffering from back-related problems such as herniated disks, bulging disks and disk degeneration. Gravity is the common cause of these problems as the continuous pulling of the body downwards places tremendous pressure on your disks, worsening pain. Inversion tables help to relieve the effects of gravity. They are designed to hold the user upside down, reversing the effects of gravity on your joints and providing relief from pain. By targeting the cause of the problem, you can find great relief from chronic back pain. Inversion tables have also been shown to help your lymphatic system by drawing out and extracting toxins from your body. Continuous use of inversion tables can repair the damage caused to disks by relieving the pressure caused by gravity and in the case of disks that are damaged beyond repair, they can alleviate symptoms, greatly lessening the day-to-day pain experienced. It for this reason that owning your own inversion table can be highly beneficial. While not a one-stop cure for all back problems, inversion tables provide you the ability to alleviate your pain from the comfort of your own home, while daily exercises on the table can build core strength, thereby reducing the stress on your back. It is estimated that nearly 80% of Americans will experience some sort of back problems in their lifetime. This isn’t surprising considering how much pressure is put on our backs with our body weight and gravity. All of that pressure pushing down on your spine can compress it, which causes the pain you feel. To get rid of back pain, you can try the Stamina In Line Back Stretch Bench, which is designed to decompress your spine and relieve back pain. I’ve given it a try myself and reviewed it below. Contoured Foam Padding: A slab of concrete with some metal rods won’t do much for relieving back pain. But when you use super dense, contoured foam you know you’re going in the right direction. This bench features dense foam on the ankle and arm supports gently and comfortably keep you in place while you are using the table. Easy to Store: To store this back stretching bench, all you have to do is keep it in a dry place. You can adjust the table back to its shortest position if you prefer, or you can leave it where it is so that it’s ready for you next time. It doesn’t take up a ton of room, but it’s easy to move if you need to. User-Friendly: This bench is also super easy to use and you can do it all by yourself. While lying on the bench, there is a small lever on the side that you push back and forth. The bench slowly stretches you out and continues to do so until you stop pushing the lever. I love this because you are able to get the exact amount of stretching you need, you have full control over it. No Inversion Necessary: People also use inversion tables to decompress their spine, but they aren’t for everybody and can even be downright dangerous for some people. Inversion tables have not been proven to have lasting effects and for people with high blood pressure they can be dangerous because they increase blood pressure. They’re also prone to accidents and people tend to make their problems worse by staying inverted too long or misusing the table. 90 Day Warranty: With this back stretcher from Stamina, you also get a 90 day warranty from the manufacturer. I like this because it gives you plenty of time to test out the bench and see how it works. Of course, there are limits to the warranty, but as long as you use it properly, you should be covered. When I first got the Stamina In Line bench I was a bit skeptical because I had tried inversion tables and didn’t like it. But I figured this was worth a shot because it was a way to decompress my spine without inversion. Setting it up was easy since it came with a detailed instruction manual, and operating it was a breeze too. The first time I tried it I remember I was surprised how comfortable it was. In my head I was imagining one of those medieval stretching torture devices, but the padding really does a lot to support you and gently stretch you. I never felt like my arms or legs were going to pop off either because I had full control over it. I was able to slowly stretch out to where I wanted to be, hold it for a few minutes, and then release it, and when I was done I felt way better. Needless to say, it didn’t take long at all for me to love this stretcher. The only downside of this stretcher is that it is somewhat expensive. Buying it isn’t likely to break the bank, but it isn’t just a couple bucks either. However, chronic back pain can really get in the way of your life and being able to relieve it without surgery is priceless. Once you start looking at the cost of surgery, or other pain relief options, this bench starts looking even more affordable. My final verdict on this back stretching bench is that it makes a great tool for relieving back pain. I have been regularly using it since I got it and I couldn’t be happier with the results I’m seeing. I highly recommend it to anyone who is experiencing back pain, especially people who also have high blood pressure, since it is safe and won’t raise your blood pressure. This simple, easy to use back stretcher could be the answer to your back pain woes. Shoppers will find exceptional value in this inversion table, with bonus Acupressure Nodes and Lumbar Bridge accessories, plus a back pain relief stretch and exercise DVD. In addition, enhanced decompression is achieved with the Lumbar Bridge and ComforTrak Bed which flexes with the user. The stretch & grip handles also allow for an easy straight back position without placing extra strain on the back. You’ll be stretching your back in comfort thanks to the patented pressure-reducing ankle system that allows you to hang full inverted without any tugging or pinching on your ankles. You’ll also have full control over your rotation thanks to precision balancing and secure lock-out. With several pre-set rotation angles included, you can invert to just about any angle you want without having to worry about flipping over or losing your balance. Patented security features include auto-locking hinges, clam locks, specialized pivot bearings and heat-treated steel parts ensure reliability and durability. Additional standard features include a heavy-duty steel base, corner feet to protect floors and scratch-resistant finish. If that’s not enough, all Teeter Inversion Tables are UL certified and tested for safety and quality. They generally outperform the competition when it comes to endurance, rotation control and ease of assembly. When you buy a Teeter, you can be sure that you’re getting superior quality at all times and a name brand you can trust. With over 2 million customers and 30 years experience, Teeter is the brand to beat. And they stand by their quality, offering customers a 5-year guarantee on their products. User Capacity: 4’8″ – 6’6″, 300 Lb. Hundreds of users nationwide have shared their experiences with the product and its features. Most reviewers agree on the device’s superior quality and its ability to fully adapt to each user’s needs. Apart from quality, comfort is listed as one of the main reasons why so many people are choosing this product. Either because of its ergonomic design or pinch-free ankle locking system, the Teeter allows users to feel safe and comfortable at all times. While the price is higher than some other alternatives, you’ll find the vast majority of customers are happy with the quality they receive for the price. When it comes to your health and safety, paying more should be a minor issue. Rounding up, the Teeter EP-560 is potentially the best quality inversion table available on the market today. We rate it a Strong Buy. The Ironman IFT 4000 Infrared Therapy Inversion Table is built with a durable tubular steel frame with scratch resistant powder coat finish. Designed with a built-in Carbon fiber F.I.R (Far Infrared Rays) heating element, the table allows users’ back muscles to relax and stretch as the process of inversion is taking place. The ankle braces have been ergonomically molded, making it a relatively comfortable product to use even when fully inverted. Inverting handle grips are also included to help users invert and exercise more comfortably. Finally, the table can be folded for practical storage when not in use. Few non-professional inversion tables feature this type of technology that allows users to enjoy the therapeutic benefits of infrared heat therapy. Research suggests that this type of therapy is thoroughly beneficial because it allows for deeper penetration into the human body. F.I.R offers major advantages over other types of heating therapies, mainly because it presents no unhealthy, electromagnetic concerns. Additionally, body circulation is greatly improved and injuries relieved. The energy surrounding infrared technology aids in decreasing stress levels, relaxing the muscles and expediting the healing of sprains and strains. The most frequently mentioned benefits are the table’s durability and its efficiency. Most reviewers agree that their back pain has been greatly diminished after extended use of this inversion table. It is sturdy, well built, and the infrared ads a nice bit of flair you won’t find with other inversion tables. On the downside, a small number of buyers have complained about the product’s lack of instructions. It certainly isn’t the easiest inversion table to set up, but note that customers are given access to online customer support, and some users have shared helpful tips online to make assembly easier. In summary, the Ironman IFT 4000 Inversion Table is an excellent choice in high-end inversion tables and is very much worth your consideration. The Innova inversion table features all the necessary bells and whistles you’d expect from a high-end back stretching machine. Featuring an adjustable lumbar pad and a padded removable head pillow, the Innova adapts to all heights and sizes ensuring a comfortable stretch for just about anyone. If that weren’t enough, there is also an adjustable heated massager built in with auto and manual settings to help your back muscles completely relax as you stretch, maximizing results. This makes it a force to be reckoned with in the inversion table market. Finally, thanks to the 4-position adjustable safety pin, easy positioning and safer inverting is made possible. Hundreds of reviewers have shared their thoughts and experiences online, and the results are what you would expect from such a quality peice of equipment. Sturdiness is one of the most frequently-mentioned features. Because of its massive steel frame, this inversion table provides maximum support and stability and will last for years. Of course, no fitness product comes without its flaws. Because of its heavy-duty steel tubing and large weight capacity (300lbs), the piece is larger and heavier than many of the others on the market and can be bulky to move around. Fortunately, the frame has been designed to fold for easy storage. To round up, the Innova ITM4800 Advanced Heat and Massage Therapeutic Inversion table offers customers the chance of a superior inversion therapy, plus the benefits of heat therapy. Featuring a heavy-duty 1.5-inch square steel frame, this inversion table offers resistance and durability that tops most average inversion tables. Sturdy and completely wobble-free the table enables users to invert much more comfortable and above all, more securely. This is an ultimate asset for most commercial tables since it is common for some devices to cause uneasiness among users who feel insecure when inverting wide angles. Thanks to its strong, steel frame and stable design, the Exerpeutic Inversion Table offers the benefits of inversion therapy to a wide range of users weighing up to 300 pounds. The table is constructed for safety and comfort with a soft, foam padded backrest that helps conceal the strong frame. The fact that the frame has been finished with a scratch resistant powder coat makes the device even more durable. Despite its sturdiness, the table offers a wide range of flexibility features that help users make the most out of their inversion experiences. For example, the foam rollers and ankle cushions hold ankles safely and comfortably during the inversion process. Likewise, an easy pull pin release makes it possible for users to release themselves when the inversion is over. In addition, thanks to the adjustable leather strap present in the device, users are able to access to different inverting angles up to 180-degree vertical position. Finally, the inclusion of extra-long handles makes it possible to go back to a straight position more easily. More and more customers are sharing their thoughts on this product. Most reviews have one point in common though, efficiency: most people find this device to have therapeutic effects on their backs. If compared to similar products, this table is considered as being more durable and balanced. A few reviewers have mentioned the item’s weight as a drawback, especially when it comes to moving the table around. Potential shoppers should realize that since this device will weigh 55 pounds, moving around may be a challenge. However, the device can be folded, which means that storage can become simple. In all, a good pick for users looking for a sturdy and practical piece. Proper balance and stability are perhaps the greatest challenges faced by most manufacturers of these Inversion Therapy Tables. The Innova ITX9600 Heavy Duty Deluxe Inversion Therapy Table provides a true balance system for easy inverting with ergonomical ankle holding system. Thanks to the table’s heavy gauge steel tubing, the table is sturdier than other similar models. Besides, the padded backrest is larger than most standard models available on the market, thus making it optimal for larger than average body sizes. Moreover, the table accommodates users from 4ft10in to 6ft6in high with a 300 lbs weight capacity. Equipped with a unique 5-position side inversion pin that replaces the old style strap and adjusts easily, the Innova inversion table allows for simple degrees of inversion. The simple process is done just by positioning the pin in desired decline position. The thick foam rollers and soft touch foam handlebars make for comfortable inverting and easy return to an upright position. Finally, the frame design allows for quick folding for easy storage. Many customers have already shared their opinions about the table and the benefits of using it. The most frequently mentioned asset refers to the product’s engineering. It is well-built and possesses good-quality material combination, which in turn results in extra balance and further stability. This by far, appears to be a major must among users who have been on inversion therapies for a long time, mostly because they claim that similar tables appear to be sturdy, but are actually all flimsy or imbalanced. It is true however, that a small percentage of users claim not to have been benefitted by the use of this product. Users should be made aware of the fact that not all conditions are equally fit to be treated the same way. Moreover, some patients could find inversion therapy counterproductive for their conditions. Consequently, medical consultation is always necessary before deciding whether the Innova is right for your case. This device is full of features that help users make the most out of its use. Equipped with three different levels, the back stretcher can be adjusted to meet the needs of both the beginner and the expert user. Moreover, the back stretcher is padded with a soft mat cover that offers optimal comfort when compared to other similar products that are made of hard plastic. It also features a bonus elastic band and trigger point ball that allows for additional muscle strengthening and relief. Experts suggest that the inclusion of the trigger point ball is essential to deal with muscle knots that are the cause of improper spine stretching. Postural defects can be progressively corrected just by using the device regularly. For those who aren’t quite sure how to use this type of back stretching device, buyers have easy access to free online training videos that outline proper back stretching techniques utilizing all of the products included. This is one of the most highly review lumbar back stretchers online, with most customers praising the device’s ability to deal with back pain in a simple and effective manner. The product is very high quality, especially for the price, and is easy to use any time of the day. A few reviewers have complained that the device has actually worsened their back pain. When buying a lumbar stretcher you should be aware of the fact that patients with certain types of back conditions should not use this type of device. An inversion table may work better for you, but a professional consultation is always the best choice in such cases. Professionally recommended for its innovative design and proven efficacy, this device enables users to relieve back tension in the lower lumbar area of the human back. Used only for 5 minutes twice a day is enough to alleviate some of the most common symptoms linked to back issues. Besides relieving back pain, this ChiSoft device is also helpful for posture correction, thus becoming a useful preventive tool. Secondly, there are no age constraints involved with its use. This means that people of all ages can enjoy the benefits of this back stretcher’s use. Physical therapists are recommending it all over the country to young people who have postural issues that may eventually lead to chronic back conditions. Featuring a 100% ergonomically-sound design, this back stretcher shows a multi-level surface together with a three gear adjustment that allows for a deeper and more closely controlled stretch. Just by following a simple assembly procedure, users are ready to make the most out of this device in no time. Also, because the back stretcher is extremely lightweight, users can easily transport it anywhere they go. Hundreds of reviews are sharing their experiences on this back stretcher online. The most frequently-mentioned benefit is practicality. This back stretcher is becoming well-known for its flexibility. Lightweight and easy to assemble, the device can be used twice a day completely hassle-free. A few users have referred to the device’s size as being a bit too small for large sizes. Most back-stretching devices are pretty standard in size so the same can be said about most back stretchers. In all, the Back Stretcher with Lumbar Support makes a fine choice to treat and prevent chronic lumbar pain. Spinal decompression works by gently stretching the spine, which relieves pressure on the spine due to gravity and helps expand compressed discs. Spinal discs are gel-like cushions between the vertebrate in your spine. For many people, this simple decompression of the cushions brings immediate back pain relief. The theory behind spinal decompression therapy suggests that with repeated use over time the release of pressure on the spinal discs may cause bulging or herniated disks to retract. This can also take pressure off of pinched nerves and also promote circulation of water, oxygen, and nutrient-rich fluids into the disks so they can heal. The improved circulation can also help reduce inflammation. When performing back traction, it is important to keep your spine evenly aligned. Never twist the spine while doing traction. But don’t let this scare you. Back traction can be extremely useful for treating herniated and bulging discs, sciatica, injured spinal nerves, muscle spasms, and degenerative disc disease. Not all inversion tables are created equal and there are a few things to look out for when choosing the best inversion table for you. Due to the nature of the exercises you will be performing, it’s important that your inversion table is durable and sturdy. Look for inversion tables made from high carbon steel. Many cheaper models are made with plastic, which can provide a huge danger risk if it breaks while you’re on it. Frames may be static or foldable, which are useful for at-home storage. The construction of the frame determines how many degrees you can tilt so it is highly important to consider. When you first begin using inversion tables, you may only tilt at low angles of 30 degrees, but over time, this will likely develop to tilting at 90-degree angles, so a sturdy frame is a must. Each inversion table should specify the maximum and minimum weight for users and the maximum degree tilting capability. Check your height and weight before buying to ensure you can use it comfortably. When using an inversion table, you will stand on the platform and strap your ankles in with clamps. The platform will support your body and I recommend you look for an adjustable platform as people have different foot sizes that must be considered. nversion tables may have thin or thick pads. Thicker pads tend to be more comfortable but be sure to look for pads made from quality materials to provide comfort over long periods of time. 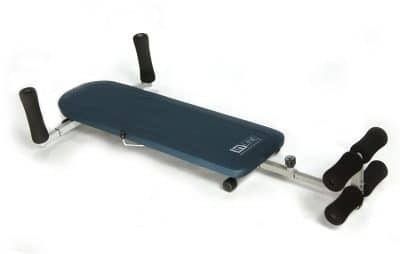 You can also find inversion tables with removable back pads that can make it easier to exercise while inverting. Cheaper inversion tables are manually inverted by the user. However, newer, more advanced models come with power motors that automatically invert the table for you at the flick of a switch. This makes the inversion process a lot easier. Some inversion tables feature the optional extra of vibration pads, which can be attached to the table to work and relax your muscles. Massages can provide added healing and relief to back pain, and when used in conjunction with the inversion table, can be very beneficial. Inversion therapy is used today by many professional athletes and back pain sufferers to counteract the natural negative effects of gravity on the body. Many studies have shown the effective results of using inversion tables for rejuvenating your disks, relaxing your muscles, improving blood circulation and relieving back pain. These results do not come instantly, however, so there are a few things to consider before you buy an inversion table. Inversion therapy is something that must be taken slowly and gradually. There are no shortcuts to be taken here. Inverting must be done gradually, starting at low angles of 30 to 50 degrees and eventually developing to angles of up to 90 degrees. For this reason, your inversion table must be sturdy above all else and comfortable enough for you to use it daily. You must consider your height and weight when buying an inversion table too. Most inversion tables specify their minimum and maximum weight limits and some specify minimum and maximum height too. You must consider the height and weight capabilities for you to fit comfortably on the table. Durability and quality of construction and materials are extremely important factors to consider. A poorly built table is a huge risk factor so, where possible, invest in a table with a sturdy construction and premium quality materials. When working within your budget, optional extras such as vibration pads or ab-building capabilities are things that can be sacrificed for a lower price tag. A well-built frame is not. As most people use their inversion table daily or at least several times a week, breakdown from regular use can happen, so it’s important to know the warranty you’re getting with your inversion table. Understanding what warranty your table is covered by, will provide you peace of mind if and when you encounter problems.